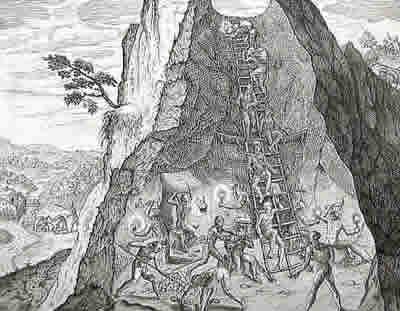 The extensive silver mines of the mountain of Potosí (in the highlands of contemporary Bolivia, at an altitude of 4,800 meters) proved among the most important sources of wealth in all of Spain’s New World holdings, fleetingly filling the coffers of the Spanish treasury for more than two centuries while relegating thousands of Indian laborers to a hellish work existence. Silver ore was serendipitously discovered at Potosí by an Indian yanacona (servant) named Diego Gualpa in 1545. Within a few years there had commenced a vast silver rush, which peaked in the 1590s, after which silver production underwent a gradual decline, though the mines continued to be worked throughout the colonial period. In 1545, the population of Potosí and its environs stood at around 3,000. Thirty-five years later, in 1580, the numbers had swelled to around 120,000, and by 1650 to around 160,000, making the remote mining center one of the largest urban concentrations in the world. Crucial to the stupendous growth of Potosí and its mining economy was the introduction of the mercury amalgamation process in 1572. Before this, Indian laborers had employed the pre-Columbian huayra technique for refining silver, which harnessed the highlands’ high winds to facilitate the smelting process. The first mercury mines at Huancavelica were discovered in 1559; others came into operation soon after. In 1571, after numerous trials, the Spanish perfected the techniques for refining Potosí’s silver ore with Huancavelica’s mercury, prompting Viceroy Francisco de Toledo to gush that the union of the two mines would create the world’s greatest marriage. Official figures show a quadrupling of silver exports to Spain from Potosí from 1571–75 to 1581–85 (from 4.6 million to 19.1 million pesos), to a peak of around 5 million pesos annually in the 1590s. By 1650, the number had dropped to around 3 million pesos annually, after which it continued to decline until the early 1700s, when the mining economy underwent a gradual resurgence, though it never reached its former heights. Potosí’s burgeoning mining economy also had important local and regional ripple effects, sparking the growth of commerce, agriculture, and specialized craftwork in surrounding communities, and in regional economies as distant as Río de la Plata, Chile, and northern Peru. According to another Spaniard, Alfonso Messia, Indian laborers descended hundreds of feet into the mines, “where the night is perpetual. It is always necessary to work by candlelight, with the air thick and evil-smelling, enclosed in the bowels of the earth. The great silver mines of Potosí thus became symbolic not only of fabulous wealth, but of Spain’s oppression and exploitation of Indian laborers, and Indian resilience and survival in the face of the extreme brutality of colonial rule.